Now the # 1 veterinary recommended natural therapy, HomeoPet was founded by Daniel H. Farrington to market products formulated by his brother Dr. Thomas J. Farrington. In 1994 HomeoPet filed labels with claims with the FDA CVM, responding to warning letters and requests for additional information HomeoPet produced additional data and materials over 5 years. In 1999 HomeoPet received marketing approval with labeled claims from the FDA – CVM. To establish clinical efficacy Daniel joined with his brother the eminent veterinarian Dr. Thomas Farrington M.V.B., M.R.C.V.S., LF Vet Homm, an honors veterinarian with an advanced degree in Veterinary Homeopathy, a degree that is recognized by the Royal College of Veterinarian Surgeons. Utilizing advances in science to analyze results from veterinary clinics and university research programs on three continents, the Farrington brothers developed a new technology, AHPT or Advance Homeopathic Pharmaceutical Technology. A.H.P. Technology addresses the most common conditions seen today as a result of social, economic and environmental changes in the world we live in. Homeopathy is a natural medicine therapy that has been used for hundreds of years. Utilizing advances in science research began in the 1970’s, highly skilled scientists working with a research laboratory identified the purest raw materials; ingredients free of all chemicals, pesticides and fertilizers. The high standards of a dedicated, FDA inspected, manufacturing facility ensures that the finished products are manufactured to standards meeting or exceeding GMP’s - Good Manufacturing Practice standards. HomeoPet LLC is the global leader in researching, developing, licensing and producing AHPT’s -Advanced Homeopathic Pharmaceutical Technology-. 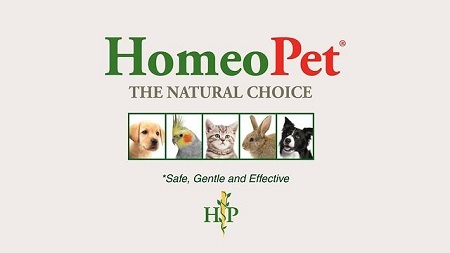 HomeoPet LLC is the only homeopathic company to have the credentials in original product quality control, in technology development; in funded university based research programs and substantiated levels of product efficacy to meet the growing demand from veterinary clinics and consumers for quality pet health care products with their unsurpassed levels of safety. Many conditions while not life threatening cause suffering in animals, previous ways of treating were with expensive and often harmful drugs that had significant unwanted side effects. HomeoPet treatments are targeted to provide support to the animals own natural healing system and bring relief without the unwanted side effects. HomeoPet products provide safe, gentle and effective relief to suffering animals. Homeopathic remedy to reduce the discomfort and provide temporary relief of a variety of minor digestive problems due to diarrhea, flatulence and retained gas. Helps to promote healing for itchy, irritated skin caused by flea, bug and insect bites. Homeopathic remedy for relief of stress that can cause pain to appear in lower back and joint areas. Homeopathic remedy provides temporary relief from constant scratching, itching, gnawing and hair loss caused by allergies.